Taken 11/30 at the Arlington Res. So we have a passerine with a brownish back and a bright yellow belly. Taking into account the bill and general shape and posture, we can say it’s a flycatcher. The brown color and yellow belly lead us to genus Myiarchus. Among the Myiarchus, Massachusetts has Great Crested as a common breeder and Ash-throated as a rare (but basically annual late fall vagrant). Obviously, my wishful thinking comment was about Ash-throated but in this case, the belly is much too bright. The edges of the wings are also much stronger than I’d expect on an Ash-throated. And the vegetation is a bit too green for a late fall vagrant, although there is an August record at Rock Meadow in Belmont. 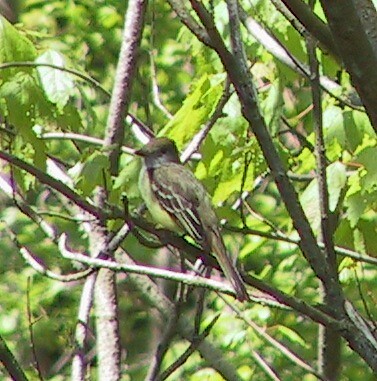 I took this picture of a Great Crested Flycatcher at Prospect Hill in May 2006. They are likely breeders at Prospect Hill, the Paine Estate, Met State, and probably any other wooded areas. As far as I know, Ash-throated has not yet been found in Waltham, but I’m sure one will one of these years. No point in using the week part now but I’ll still post one as I find something worth posting. Like the last one, this is a reused photo so clicking on it gives it away. So we have a dragonfly. By the apparent large size, striped thorax, spotted abdomen, and vertical hanging, it’s one of the darners. We can eliminate Common Green and Comet by the lack of a solid thorax, Springtime, Harlequin, and Taper-tailed by date. Swamp and Cyrano have a more ringed appearance. Spatterdock has bright blue eyes. That leaves the genus Aeshna, of which there are quite a few in Massachusetts. We can eliminate Mottled on thoracic pattern right away but several others are close. However, looking at the appendages we can see that they are fairly expanded and paddle-ish. Only Lance-tipped and Shadow match those. Lance-tipped is eliminated by the thoracic pattern, which would be more jagged. Shadow normally shows thin stripes with a slight triangle extending from the rear of the front one, which this one shows. 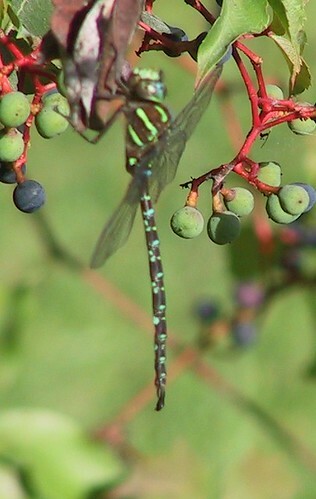 Shadow Darners are among the most common darners, especially late in the season. In fact, after the first week or two of September, I assume it’s a Shadow unless otherwise. They’re relatively darker than most others and often fly very low to the ground, which makes them much easier to observe. They can fly quite late (I just had my first November record the other day, so they may still be out there now). Taken September 2005 at Prospect Hill. And since I’ve used this photo elsewhere, it’s already tagged, so click for the answer if you’re impatient. So, it’s clearly a moth. General shape and pattern led me to the genus Idia. Scanning through the MPG plates, I presumed it was the American Idia (Idia americalis). With some assistance on Bugguide, that was confirmed based on the exact shape of some of the lines. See the photo there for details. 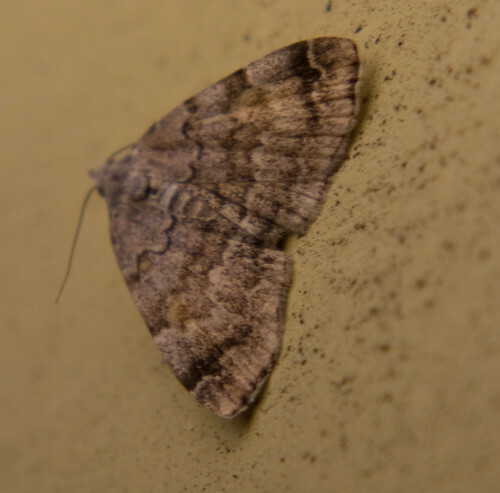 It appears to be a fairly common moth, flying in late summer in Massachusetts. Several other Idias can be found as well, presumably for fairly similar flight seasons. Taken at the porch light on 9/28. Whoops, once a week somehow turned into 3+ months. But since I’m sitting around with nothing to do while the Red Sox play, it’s time to get going again on this. So we have a funky looking bird. Based on the short tail, the streaking on the body, and the oversized head, we can guess that it’s probably a juvenal. The bird appears to have dark wings and looks to have a fairly thick bill. 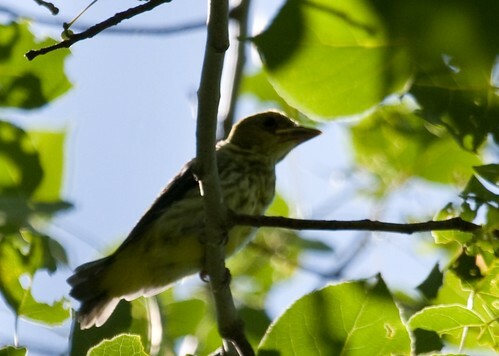 Those two features scream out Scarlet Tanager, which is exactly what it was. My ID was made easier by the bright red daddy coming over to shove food down this one’s throat. I thought I took a picture of that, but apparently not. Scarlet Tanagers are fairly common spring to fall in Waltham. I find them regularly at Met State, the Paine Estate, and Prospect Hill and have found young ones like this guy at Met State and Prospect Hill. I’m sure they breed at Paine as well, although the one I saw chasing a cowbird this year apparently was just hanging out as a Red-eyed Vireo hopped over and fed the cowbird. About time I got one up. Taken 6/24/2007 at Met State. This week we have a bird that’s clearly on the small side. It’s mostly gray but has a reddish patch on the wings and some streaking. With the streaking, sparrows are about the only things that come to mind. Of the larks and pipits and other possibilities, they’re all a little thinner, so a sparrow it is. With the reddish patch and overall gray color, there aren’t many sparrows that are possible. In fact, the only one is Swamp Sparrow, which is what this bird is. 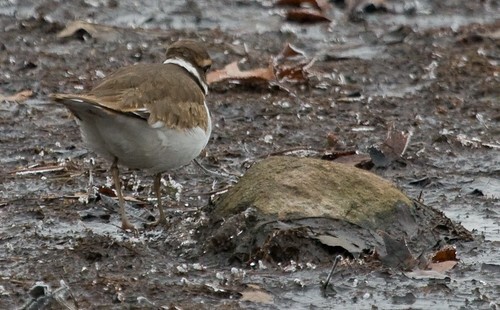 In Waltham, Swamp Sparrows appear to breed at the marsh in Met State and possibly at a couple other marshes. They’re also fairly common migrants, especially in fields, but occasionally elsewhere. This was one of the elsewhere ones, as it was in the wooded section of Beaver Brook.